Twisted pair cables are widely used in transmitting information, especially across great distances. The twist in the wire cancels out any magnetic interference that may develop in the wiring. 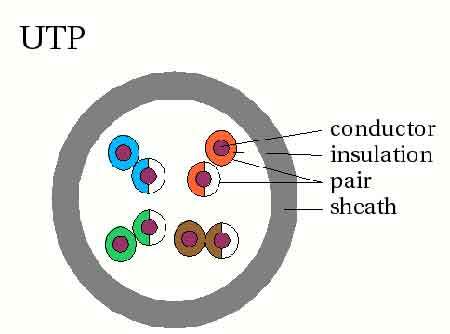 There are two common types of twisted pair cabling, STP and UTP. The S stands for Shielded, the U stands for Unshielded, and the TP stands for twisted pair for both. STP simply has additional shielding material that is used to cancel any external interference that may be introduced at any point in the path of the cable. UTP cables have no protection against such interference and its performance is often degraded in its presence. Using STP cables ensure that you get the maximum bandwidth from your cabling even if the external condition is less than ideal. The biggest drawback to using STP cables is the higher cost. The shielding is an additional material that goes into every meter of the cable, thereby raising its total cost. The shielding also makes the cable heavier and a bit more difficult to bend or manipulate in any way. This is not a big issue but something that users should know when choosing between STP and UTP. In terms of usage, UTP is the more prevalent and popular cabling that is used in most homes, offices, and even in large scale businesses due to its lower cost. STP is commonly used by large scale companies in high-end applications that require the maximum bandwidth. STP cables are also used in outdoor environments where the cables are exposed to the elements and manmade structures and equipment that may introduce additional interference. Good examples of this would be the telephone/internet cables that run from your home, to the junction box, down to the establishments of your provider or ISP. Ben Joan. "Difference Between UTP and STP." DifferenceBetween.net. April 6, 2010 < http://www.differencebetween.net/technology/difference-between-utp-and-stp/ >.